Third edition D&D was the most rules intensive set ever released, yet the rules had an elegance to them despite their rigidity. The designers of the third edition figured that the rules would be mastered slowly but, once the rules had been mastered, that the games would run better. Updating the rules to a 3.5 edition not only set back people’s mastery of the rules, but it also made it difficult for third party publishers of D&D related material (which had been generously granted a perpetual open license) to keep up. Their work now had to be updated to work with the new rules. 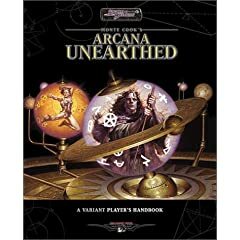 “My favorite of all the third party rules sets released during this time was Monte Cooke’s Arcana Unearthed. It was released at roughly the same time as the 3.5 edition and was presented as an “Variant Player’s Handbook.” It contained everything necessary to play the game, but presented a different set of races and classes than had been traditional to D&D for years. Instead of the traditional Elves, Dwarves and Halflings (i.e. Hobbits), Arcana Unearthed presented the half-lion Lithorians, winged Sprytes, and Giants. In addition, Monte Cook included racial levels would could be taken just like any other class level. This was presented before Savage Species and, as far as I can tell, was clearly an influence in the latter. Classifying some feats (such as Ambidextrous) as talents which can only be taken at first level. This makes a lot of sense to me, because you’re either born being ambidextrous, or you’re not. Unifying the magic system so that there were no longer the division between arcane and divine spells. I really liked that, because I always felt that the that division in magic was artificial. Why can’t Merlon the Magician heal someone? It seemed one of D&D’s artificial distinctions. Monte also divided up the spell list into spell complexities (Simple, Complex, and Exotic). If you were a simple magic user, such as the Witch or Mage Blade, you only got access to simple spells. If you were a magic specializing magic user, you got access to all simple and complex spells. If you were the Druid like Greensbond, you got access to simple spells and spells that were classified as plant related. Another nice touch to the magic system was allowing casters to cast their spells as a greater or lesser effect. If they chose to cast their spell for a lesser effect, then it used a spell slot that was one level down, and vice versa. This made magic users wonderfully flexible, however it does pose a problem for those of us who might want to integrate AU with Pathfinder because those spells don’t have a greater or lesser effect. Speaking of, I guess I forgot to mention that Monte came up with an all new magic spell set that included sub-categories for each new spell to allow magic users specializing in certain elements or sphere (such as a Winter Witch specializing in cold) then you got access to more complex spells in that area only. Introducing some classes that were full of flavor and very flexible, such as the witch and totem warrior, and the Mage Blade which was a combination fighter magic user. All in all, I loved Arcana Unearthed. Now that third edition D&D has been abandoned by WotC, it remains a viable alternative for those of us who don’t want to switch over. albeit a bit out of date. 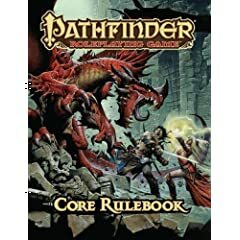 Which bring me to the topic of Pathfinder, the a new Core Rulebook to replace the 3.5 D&D player’s handbook was just released this month by Paizo Publishing. I ordered a copy and I’m pleased to see the result. They did a great job fixing some of the commonly encountered complaints of 3.5 D&D. However, they changed the power level of the classes somewhat: they all ended up getting more powerful. Even the base races are more powerful than those in the original D&D rulebook: for instance, the humans in the Pathfinder rules get a generic +2 they can add to any one ability score. Upping the power scale of the base classes does pose a problem for those of us wishing to present Unearthed Arcana as simple another option open to players, because no one would chose the less powerful classes now that the more powerful ones presented in Pathfinder are available to them. But that’s a shame, because I really do love the work that Monte Cook put into his UA setting. So I wanted to put some time into updating the UA material for players who wanted to explore that setting in a Pathfinder rules. Some might find this a silly goal. Why not just let the two rules systems exist separately. After all, we are talking about separate roleplaying world, so there should not be a need to unify the two. That’s certainly an option, but, given that the D&D world has already been bifurcated into fourth edition D&D players versus 3.5, I see no reason why we should further bifurcate the 3.5 players into Arcana Unearthed v. Pathfinder. By unifying the system, it allows 3.5 players greater variety in races, classes and magic systems. It furthermore allows GMs to utilize various generic D&D modules in their AU adventures and, given that there have been a limited number of AU modules, this is a good thing. This post is the first in a series that will look at how to bring the two rules systems to some for of unity.